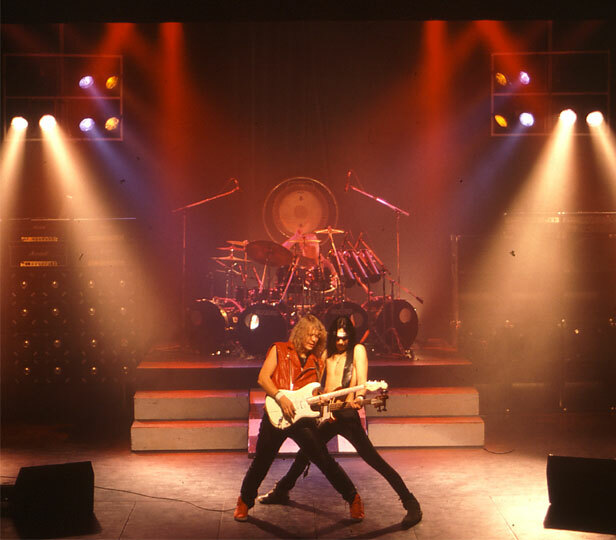 The band was founded by Björn Stigsson, Håkan Andersson and Kjell Andersson in the early 80′s. The band’s first record was released as a Maxi EP back in 1982, it included four tracks, and was titled ”Stå och titta på”, all lyrics in Swedish. The first album released by Leviticus, the last recording with Swedish lyrics, was released in 1983, and was titled ”Jag skall segra!”. In 1987, Leviticus released the album ”Setting fire to the earth”, which became a best-seller around the world, and which got lots of great reviews in many different music magazines. Before this recording, Håkan Andersson left the band and Ez Gomér replaced Håkan on the bass guitar, and Terry H. became the band’s lead singer. In 1989, Leviticus released the album ”Knights of heaven”. This album was recorded and produced in the U.S.A. This album also got some great reviews in a lot of magazines worldwide. The Swedish newspaper ”Göteborgs-Posten” wrote ”Leviticus takes the top position in Swedish hardrock, together with Europe. On this album, Peo Pettersson replaced Terry H. on lead vocals and Niklas Franklin replaced Ez Gomér on the bass guitar. This album was produced by the famous Elefante brothers, John and Dino. After 13 years of silence, Leviticus got together again and started playing. The band released the album, ”Live at Bobfest 2003″. The line-up on this reunion was: Peo Pettersson on lead vocals, Björn Stigsson on guitars, Kjell Andersson on drums, Niklas Edberger on keyboards, and Niklas Franklin on bass guitar. Let me fight – Day by day. Maxi-single Talking Music – 1984. Flames of fire – Love is love. Maxi-single Solidrock U.S.A. -1987. Isn`t it love – Born again Royal Music – 1989.